There’s no doubt that vegetables can be intimidating. There are so many different ways to cook them and each way will reap a different result. 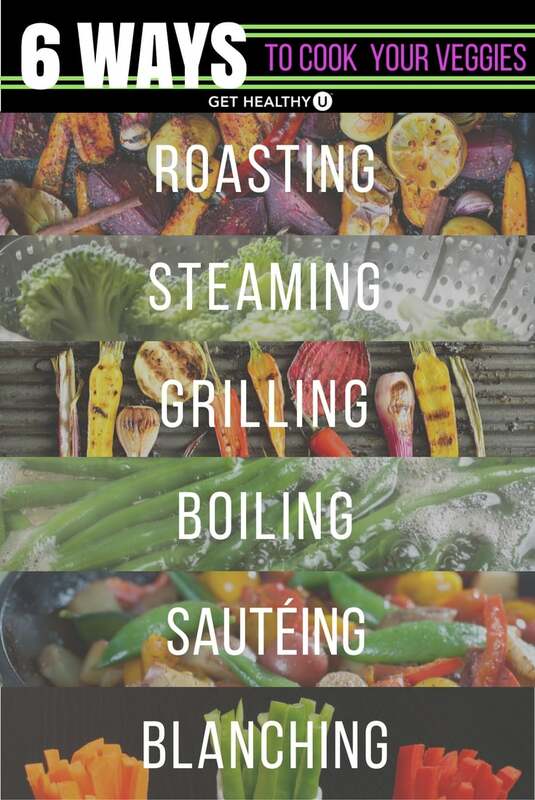 That’s why we’re providing you with our 6 favorite methods to cook your vegetables and 6 reasons why you should try them. You’ll be amazed by how each method highlights different flavors! And don’t be afraid to get creative with seasonings—the sky is the limit! Click here to get your printable chart of 6 Ways to Cook Veggies! Why: Grilling vegetables creates a very specific smoky flavor that is great for barbecue dinners. You can’t get this flavor with the other methods. It’s even better if you have a charcoal grill. How to Grill: Preheat the grill for 15 minutes to let it heat up. Slice your vegetables however you prefer, toss them lightly in oil, and season to taste. Smaller vegetables should be cooked wrapped in foil and larger veggies like eggplant or zucchini can be cooked directly on the grill. If directly on the grill, flip vegetables at 2-3 minutes and if wrapped in foil, anywhere from 7-12 minutes—or at desired tenderness. Why: Sautéing vegetables (like onions) is great for caramelizing or blending flavors together. It’s one of the most common ways to cook vegetables, and some vegetables are best sautéed, such as spinach. But experiment with it to find what works best for you palate! How to Saute: Heat a pan over medium heat and add a teaspoon to a tablespoon of oil. When the oil begins to sizzle, add your diced vegetables (typically the smaller the better). If you’re combining vegetables, add ones with longer cooking times first and additional ones accordingly. Season to taste and cook until desired tenderness, stirring occasionally. How to roast: Preheat your oven to 425 degrees. Slice, dice or spiralize your vegetables into even sizes. Coat them in your favorite oil and season to taste. Give them space on a parchment- or foil-lined pan. Roast until desired tenderness (times vary depending on size and type of vegetable). Why: Blanching vegetables is useful if you plan on freezing them. It helps maintain their bright colors and crisp consistency. Blanching vegetables doesn’t cook them, it tenderizes them, which is why it’s also a great method when you’re making a proper crudité. How to blanch: Boil a large pot of water over high heat, then add a teaspoon of salt. Cut veggies uniformly, then add one type of vegetable into the pot at time. Depending on denseness, blanch the vegetable for 30-60 seconds. Remove vegetables with a slotted spoon and plunge into a bowl of ice water. Remove the vegetables when cool, dry and either use for crudité, on top of salads or freeze in a freezer-safe bag. Why: Steaming vegetables is probably one of the quickest ways to get the job done. It’s a great method if you don’t plan on seasoning them beforehand. It’s also a great way to cook vegetables without drying them out. How to steam: Cut vegetables into uniform sizes. Add an inch or so of water to a pot and let it come to boil. Place vegetables in a steamer basket and place the basket over the pot. Cover with a lid and cook until vegetables are tender when poked with a fork. How to boil: Bring a large pot of water to boil and add a pinch of salt. Either leave vegetables whole (like our potato or beet example) or cut them uniformly. Cover with a lid and cook over a boil until the vegetables are tender when poked with a fork.